​Nesting (2016), a collaborative exhibit with Erin LaBonte, will be on display from March 7 through April 8 at the Founder's Hall Art Gallery, located at UW-Manitowoc, 705 Viebahn St.
"Nesting" is an exhibit of photographs LaBonte shot of Lindemann and her son, Oliver, in their home in Cleveland, Wis. The images emphasize patterns, colors and light while documenting, from an outsider’s perspective, the everyday interactions between mother and child. LaBonte’s intimate series of mother and son is accompanied by Lindemann’s poetry. “The poems in this series meditate on the way a new mother and son interact in the space of their home," Lindemann said. "Some of the poems respond directly to Erin’s photos, and others are more grounded in the very intense, emotionally powerful experiences of early motherhood." A short poetry reading/reception is scheduled for 6 to 7 p.m. on March 30 at the gallery. 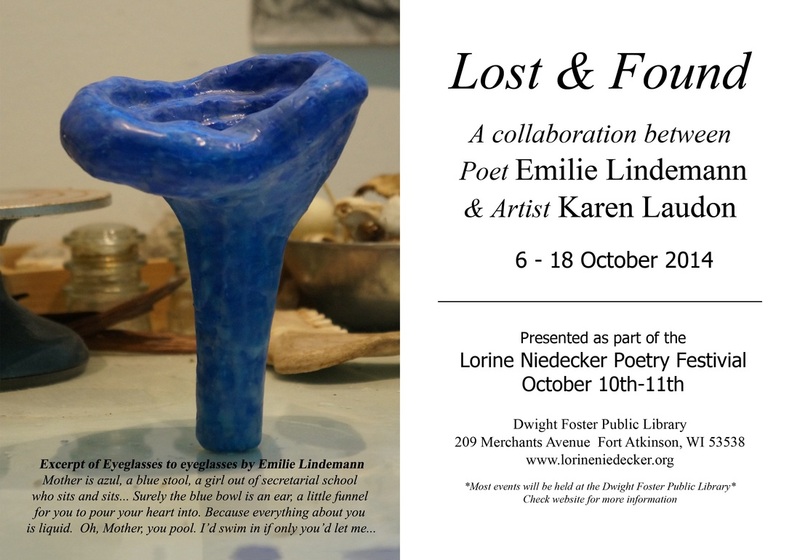 Lost & Found (2014) is an inter-arts collaboration by poet Emilie Lindemann and visual artist Karen Laudon. Poetry, two dimensional images, and sculpture of wood, other natural materials, and found objects explore Lorine Niedecker's missed motherhood, her conflicted relationship with her own mother, and thoughts about loss and unrealized potential. Lost & Found will be exhibited at the Lorine Niedecker Wisconsin Poetry Festival in October 2014. Performance Anxiety (2014) was an inter-arts performance piece that used poems, video art, and experimental music to tell the story of three female violinists who connect across impossible channels. Presented as part of UW-Manitowoc's Regional Writers Series, the performance included video art by Erin LaBonte, keyboard compositions and performance by Bethany Lindemann, and poems and violin by Emilie Lindemann. Also presented at Paradigm in Sheboygan, Kathie's Stage Door Pub in Manitowoc, and Rozztox Cafe in Rock Island, IL. The Cooking Show (2013) is a video art/audio poem collaboration with Erin LaBonte. Head (2013) is a video art/visual poem collaboration with Erin LaBonte. 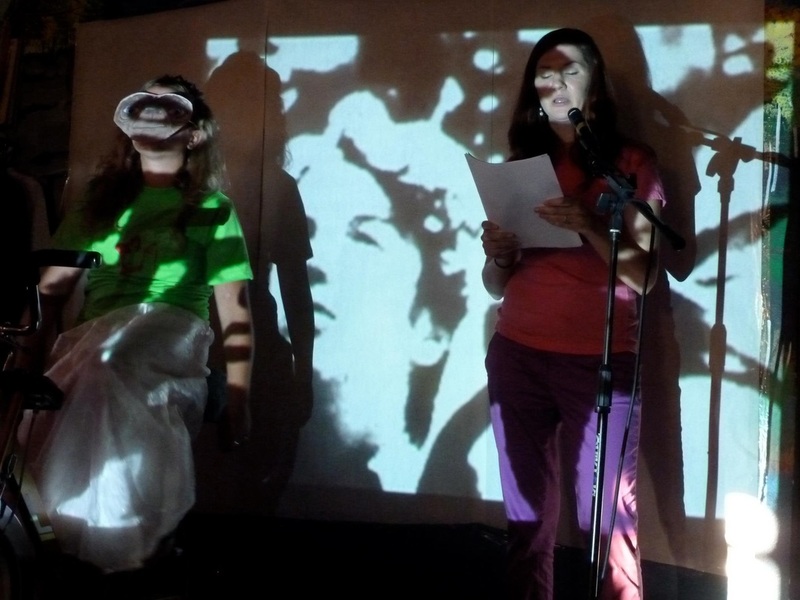 Queen of the Milky Way (2012) was an inter-arts performance with film projections and performance art by Erin LaBonte and poems and book art by Emilie Lindemann. 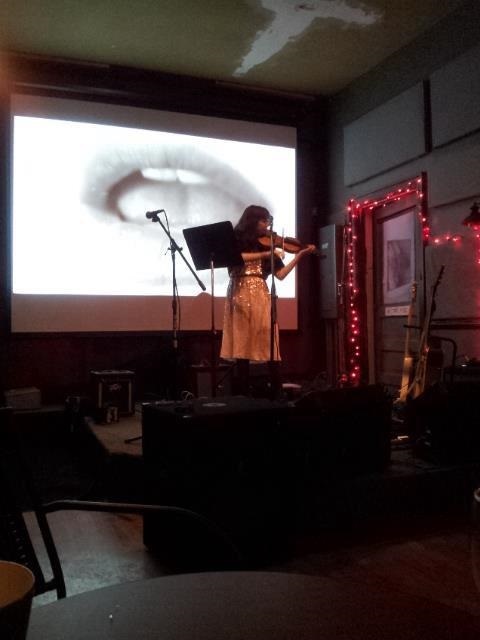 The piece was performed at Culture Cafe in Manitowoc, WI. From Nesting (2016). Photo by Erin LaBonte. Performance Anxiety (2014) was an inter-arts performance piece in collaboration with visual artist Erin LaBonte and musician Bethany Lindemann. Queen of the Milky Way (2012) was a collaboration with Erin LaBonte.